Fasten your seatbelt for a flight through 500 years of Dutch history. 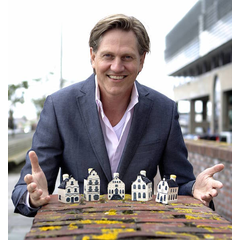 Our audio tours reveal the secrets behind the Delft Blue KLM houses. Since the 1950s, KLM Royal Dutch Airlines has presented Delft Blue miniature houses to its Business Class passengers. The iconic miniatures are known the world over and represent monuments in Amsterdam, and other major cities across the Netherlands. The book 'Little Kingdom by the Sea, a celebration of Dutch cultural heritage and architecture' by Dutch author Mark Zegeling offers you an exclusive peek behind the facades of the KLM Collection and reveals amazing stories about the inhabitants of these historic houses. Among them are pioneers, innovative entrepreneurs, old Dutch masters and other remarkable characters who left their mark on Dutch history, culture and architecture. Extensive research, including interviews with architectural historians and the current residents of the historic buildings, have yielded a wealth of information, engaging anecdotes and unique and moving stories.